On Wednesday night 18 February 2015, Foxtel aired an episode of ‘Selling Houses Australia’ in which the suburb, Haberfield featured. 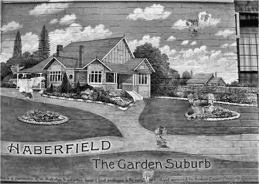 According to the Dictionary of Sydney, Haberfield, in the municipality of Ashfield, was Australia's first successful planned 'model suburb', embodying the then-evolving international garden suburb principles. Begun at the time of Federation in 1901, it predates British examples such as Letchworth (1904) and Hampstead (1907). This visionary social experiment was so financially successful that it helped lock in the great Australian dream of the quarter-acre suburban block with dwelling, which has dominated how Australians seek to house themselves. to encourage the removal and reversal of those components which detract from the heritage significance of Haberfield. Haberfield is significant at both a state and national level. It constitutes a picturesque aesthetic of streets, shops and single-storey houses in the Arts and Crafts and California Bungalow styles. Haberfield is a research repository of Federation-era architectural details, house layouts, garden design and planting reminiscent of early planning of public infrastructure. 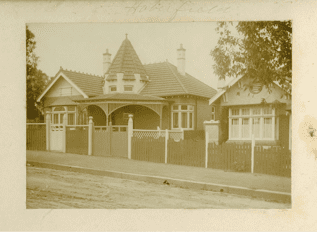 Haberfield has state social significance as a place which garnered community support for the suburb’s protection. According to the Dictionary of Sydney, the Haberfield Development Control Plan is regarded as an exemplar with many conservation area management documents emulating it. Haberfield as a suburb was envisioned by the real estate entrepreneur and town planning advocate Richard Stanton who was involved with the provision of infrastructure, sandstone kerbs and gutters, brush box street trees, buffalo grass nature strips, sewerage, gas and electricity services. Stanton's vision also included controls that laid the foundations for local government statutes governing suburban subdivisions – side setbacks to enable access to natural light and minimum lot sizes and front building lines including the separation of land uses and specification of materials. He also initiated vertically integrated business arrangements, providing term finance, building materials, fixtures and fittings and landscape gardeners. 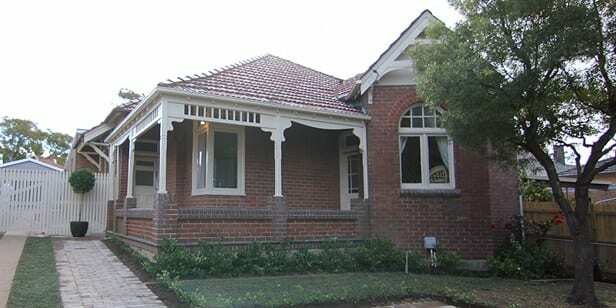 All the houses in Haberfield were individually designed by the company's architect, John Spencer-Stansfield. It was during this time that provision of parking and garaging for the motor car became incorporated into the planning of the suburb. Haberfield was marketed as a total package intended for a rising middle class. Haberfield is located within 30 minutes by tram (as they ran in those days) and ferry to the centre of the city. It was largely sold to prospective home buyers as a 'slumless, laneless and publess suburb'. Richard Stanton was an enthusiastic supporter Australian Federation. This is reflected in street names, the rising sun motifs, waratah and flannel flowers and the first Australian coat of arms on the newly formed Australian army houses. Today, Haberfield is known for the Italian culinary influences on its small shopping strip along Ramsay Street. After WW2, many Italian migrants settled in the suburb. According to the Dictionary of Sydney, amongst the many people associated with Haberfield are the composers John Antill and Peter Dodds McCormick who wrote 'Advance Australia Fair'; the singer Peter Dawson; Joseph Neal Grace who founded the Grace Bros department stores with his brother; and more recently, Jennie George, the president of the Australian Council of Trade Unions in 1990s and later a federal MP; and John Brogden, the former state Liberal Party leader. 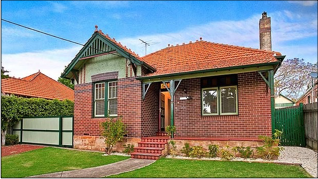 Rappoport Heritage has undertaken numerous heritage studies and reports in the suburb of Haberfield and is both knowledgeable and respectful of the suburb’s innate historical and aesthetic significance. Rappoport offers its clients heritage design advice as to how to improve, modify or extend a heritage listed home or homes in conservation areas.